In 1940 when the Walker Art Center opened on a cold January night the landscape around the museum was quite different than today. The sloping hill we know as Open Field was a forest of trees between Vineland and Groveland Place and across to Bryant Avenue South. The Walker’s building was a 1927 brick and terra cotta box with turrets in a Moorish style. And across Vineland Place in the Parade Grounds sat the Armory Gardens, a horticultural showcase for summer flowers. We don’t often think of an open space as having a history but in the case of Open Field there is an ongoing tradition of artistic use. Here are a few images to put the space in perspective. 1940. The Walker Art Center Art School was created as part of the WPA (Works Progress Administration) with a mission to put artists to work in community-oriented projects. A team of artists under the direction of local artist, Mac Le Sueur, provided art classes to adults and children for ten years. 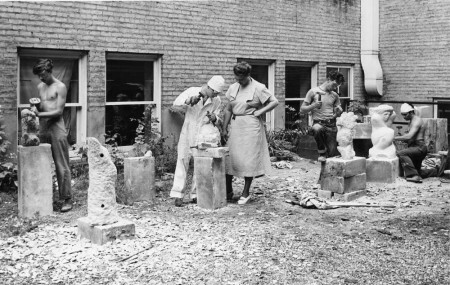 Sculptor Evelyn Raymond teaching a sculpture class outside in the courtyard adjacent to the Walker Art Center, 1940. Rolphe Dauphin for Walker Art Center. 1941. Idea House I, a demonstration house built by the Walker Art Center opens near Bryant Avenue South. The house remains operational for 20 years. 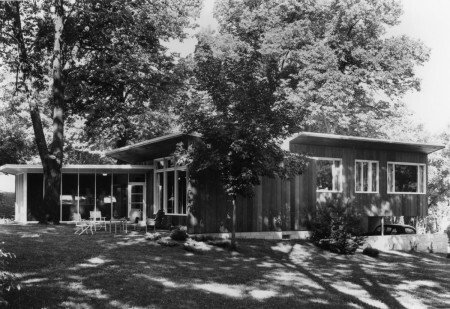 It was home to several Walker staff members. 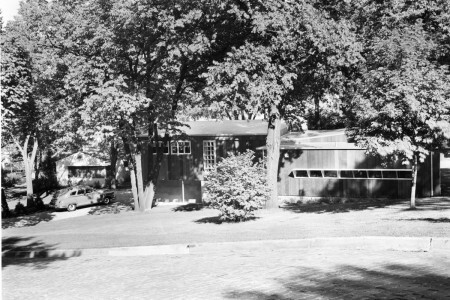 The house was torn down in 1961 to make way for the Guthrie Theater. Front of Idea House, I. Rolphe Dauphin for Walker Art Center. Back of Idea House, I. Rolphe Dauphin for Walker Art Center. 1947. Idea House II, a second demonstration house built by the Walker Art Center opens next to Idea House I. This modern postwar home was a success with patrons and critics alike. 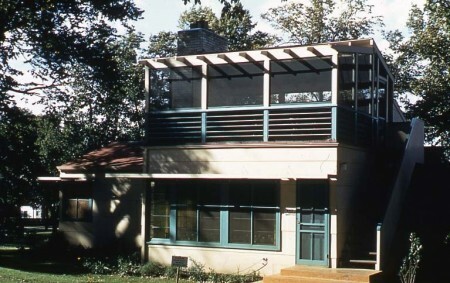 It was also home for the Walker’s Director, H. Harvard Arnason, and family during the 1950s. 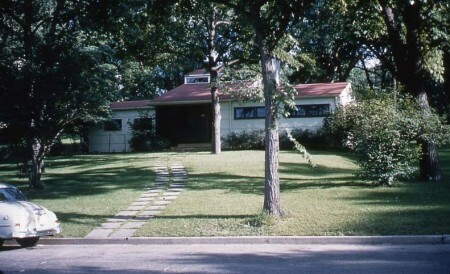 From 1963 to 1969 the house was the administrative office for the Guthrie Theater. It was torn down in 1969 as part of the Walker / Guthrie expansion which included the brick Barnes building. Front of Idea House II, 1719 Bryant Avenue South. On the left is Idea House I. Rolphe Dauphin for Walker Art Center. Back of Idea House, II. Rolphe Dauphin for Walker Art Center. 1953. 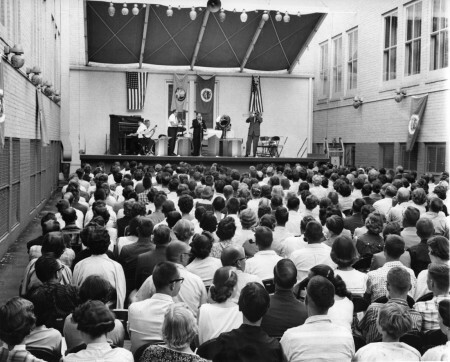 Starting in 1953 the Walker hosted the Courtyard Jazz Concert Series featuring the popular Doc Evans. Doc Evans and his Dixieland Orchestra, 1958. Eric Sutherland for Walker Art Center. 1971. 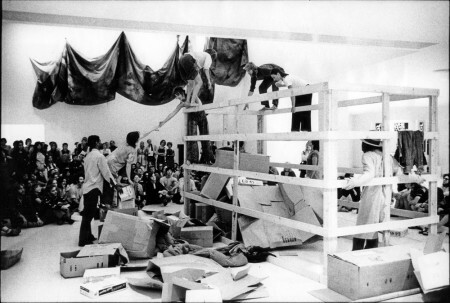 During the opening festivities for the Walker’s Barnes building in May 1971 the experimental dance troupe Grand Union featuring Yvonne Rainer, Trisha Brown, Barbara Lloyd, David Gordon, Douglas Dunn, Nancy Green, Dong, and Becky Arnold performed throughout the building and surrounding area. Grand Union performance in the outer lobby of the Walker/Guthrie complex, May 28, 1971. Tom Berthiaume for Walker Art Center. 2005. Reminiscent of Grand Union, Sarah Michelson created Daylight (for mpls) for the Walker’s opening of the Herzog and de Meuron building in September 2005. The performance included local dancers from the twin cities in a performance that occurred in traditional spaces as well as stairwells, corridors and outdoor areas. Looking out of the Cargill Lounge windows onto a performance segment to “Daylight (for mpls)” September 15, 2005. Gene Pittman for Walker Art Center. As part of the expansion in 2005 Walker Art Center commissioned Sky Pesher by James Turrell. This sublime space has been a popular retreat for beautiful sky views and occasionally as a stage for musical events. 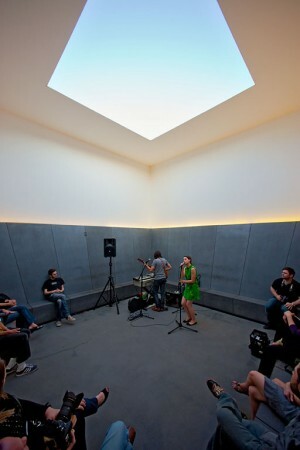 “Skyspace / Soundscape” summer concert series featuring Lookbook performing in James Turrell’s “Sky Pesher”, 2009. Cameron Wittig for Walker Art Center. 2008. For the 20th Anniversary of the Minneapolis Sculpture Garden miniature golf returned to the Walker with a 10-hole artist designed course in the summer of 2008. Walker on the Green, opening event, May 23, 2008. Cameron Wittig for Walker Art Center. Artist-in-residence, Tomas Saraceno created Museo aero solar at the Blake School in October 2008. 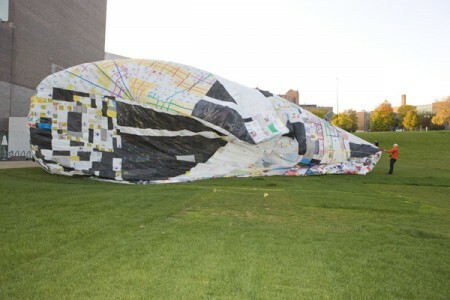 The balloon was inflated at the Walker Art Center, October 11, 2008. How will the Open Field continue to transform? Come visit the Walker this summer to experiment and explore the possibilities.